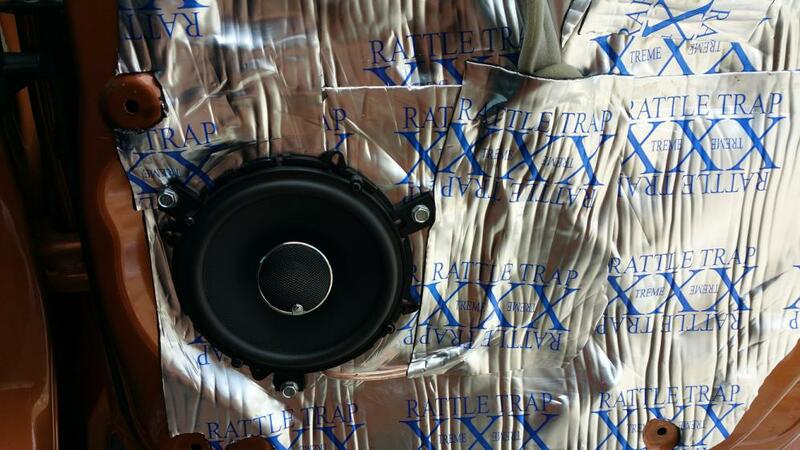 Since I replaced my stock speakers and added a subwoofer to my car, I started experiencing my doors rattling, especially when I listen to a song with a lot of bass. Sometimes I have to lower the volume for the rattling to go away. 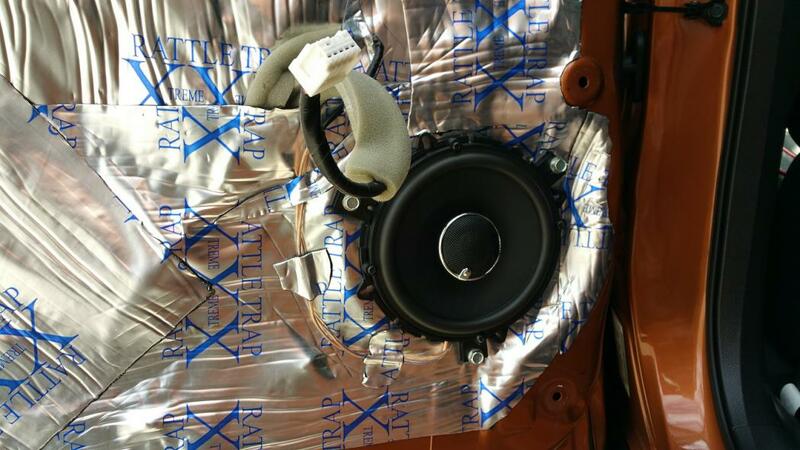 The speakers I have installed in my car are high powered, 300 Watt RMS total and the subwoofer is 75 Watt RMS. The speakers produce lots of bass, which causes the door to rattle a lot. I did some research and came with with sound mat that you installed in the car door to eliminate the rattling. 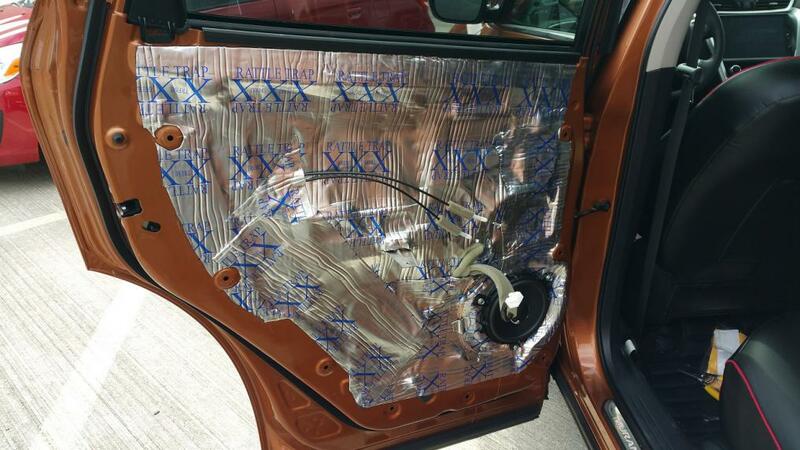 Metal enclosure, which is the car door in this case is not a good sound barrier, the sound wave the speakers produces travel through the metal, and gets spread around the car. 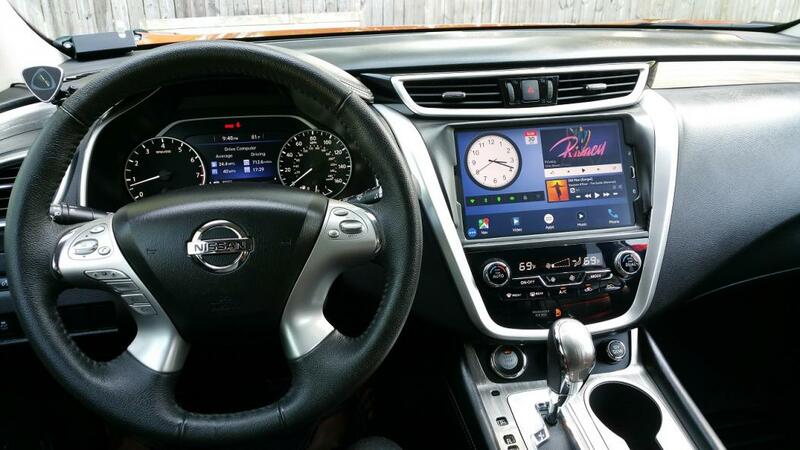 You loose lots of bass and sound quality, as the sound is not confined within the car. This is why you never enclose speakers in a metal enclosure, hardwood is the best enclosure for speakers. The way you can tell, turn on your speakers a loud volume, then from the outside of the car, put the palm your hand on the door, you can feel the door's vibration, this is not good. 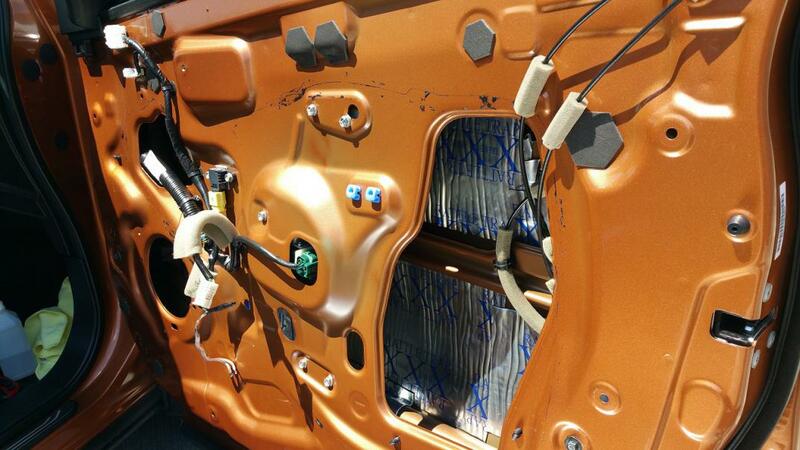 The murano does not have any sound barrier inside the door, it is all bare thin metal. 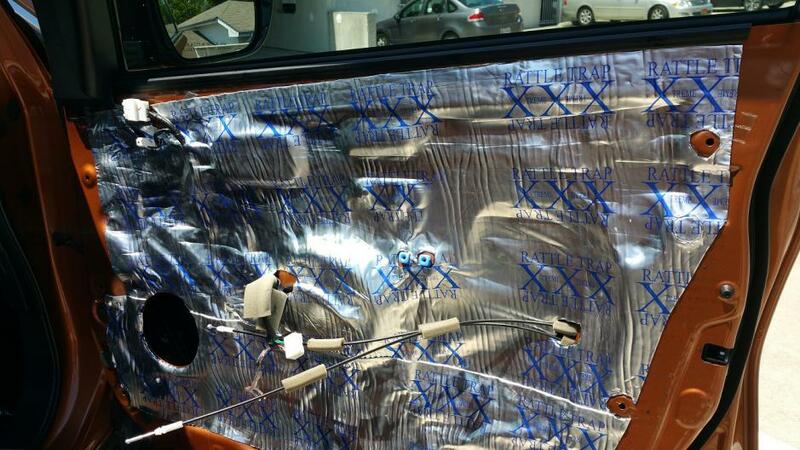 If you are an audiophile and and want to get the most out of the premium speakers you have in your car, you definitely need to install sound deadening, in this case a sound mat. The sound mat also helps with road noise, as the engine noise and the surrounding road noise is not transferred inside the car as you drive. The one I bought is FatMat, from amazon; 50 sq ft was enough to cover all 4 doors in the murano, inside and outside the door. 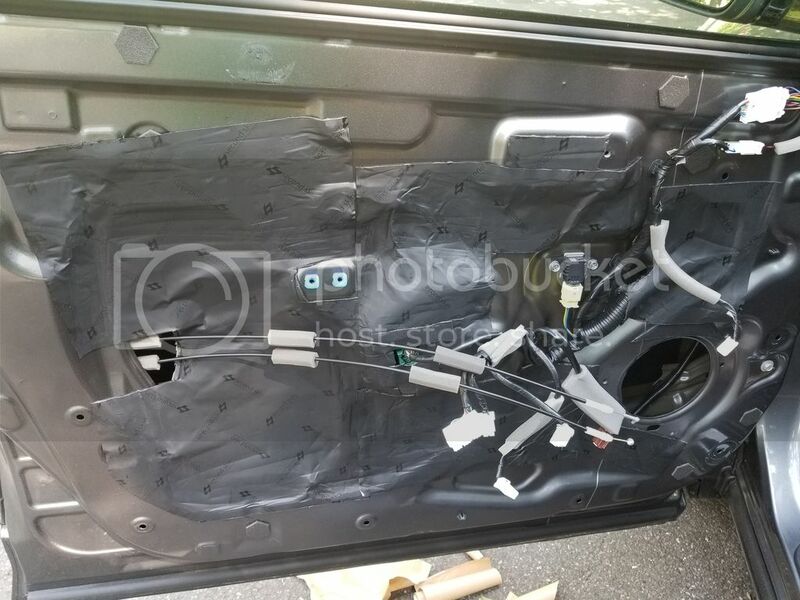 The installation was not that hard, but it is time consuming; it took me 4 hrs to do the driver's side door, and 2 hrs for each of the remaining door (10 hrs total spread in 2 days). When you put the mat inside the door, you need to cut it in small pieces, that way it will be easy to fit in hard to reach places. Also the material is easy to work with and conforms to the contour of the door very easily. The sticky glue is very strong, so this is a permanent installation. Also, in the video, you can see how the speakers move when I listen to a song with lots of bass. All these vibrations are now deadened by the sound mat instead of being transferred to the metal enclosure. Aren't you afraid the people in the cars next to you will not be able to hear your music and notice you? bwebb6322 and assad like this. I had the 2011 and with the stock speakers, the skin of the front doors detached themselves from the door frame. these skins are not welded but with some calking, should I say. I don't know about 3rd generation doors, but 2nd were very fragile. Hello ASSAD. I am curious about doing this and it looks fairly easy. 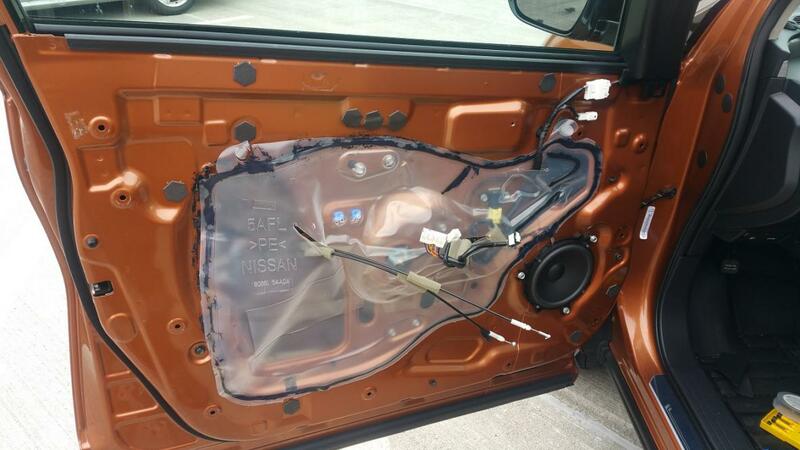 Any picture or word of advice in regard adding the sound dampening product inside the doors? Your picture number 4 shows that you did the inside. Also, have you notice a better sound response from the speakers? How about the overall noise when driving on the highway? Thanks. I would like to determine if it is worth doing this. Thanks. It made a big difference in sound, especially the bass, it also stopped the doors from rattling. As far as road noise, I cannot tell for sure, but I am pretty sure it helps; the murano is a pretty quiet ride in itself. The install is pretty easy, it is just time consuming (~10hrs for all 4 doors). I did the inside of the door to get better result, since the material was not that expensive, I had enough for all 4 doors inside an outside (50 sq ft). For inside of the door, I only covered the places I could reach with my hands, namely right behind the speakers, along the top and bottom of the door, it will be easier if you cut the mat in small pieces for the inside. If you are going to do this, make sure you wear gloves, one side of the mat is aluminum and can cut your fingers if you are not careful. The material is also pretty sticky, the glue is pretty strong, so make sure you position it right the first time, or you will have a hard time trying to pull it out. I will do my trunk this weekend, since I also noticed some rattling coming from there. Did you go with the 50 mil or 80 mil for the install? Was there any contact points between door skins/windows etc to watch out for? What did you think of this material compared to dynamat? This is the one I bought from amazon (80mm), 50sq ft for $109, covered all 4 doors of the murano + inside the door. If you want to do the trunk, you will have to buy more. I have never used Dynamat, so I cannot compare the two. I read through the reviews and I believe they are considered top of the line, but it is expensive. I went with the cheaper one FatMat, and I am glad I did. It works great for its purpose, and also easy to work with. It bends and cuts very easy, and also conform to the contour of the frame (as you can see in the pictures). 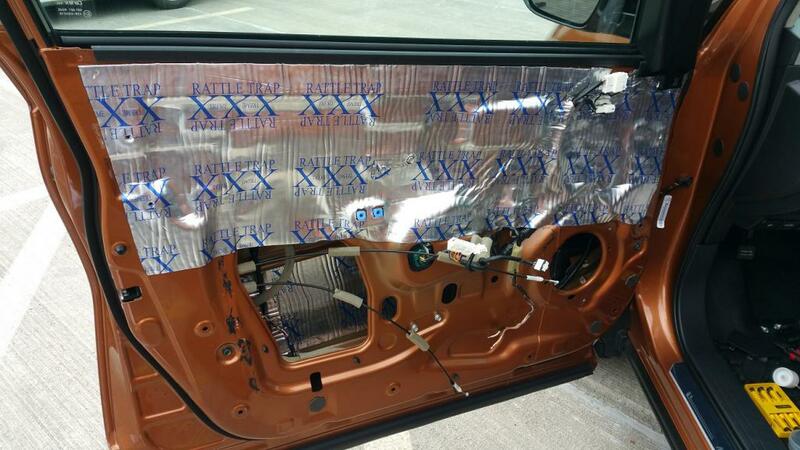 There is no contact point between the door skin and the window you have to worry about, as long as you stick the mat to the frame you will be fine. If you are doing inside the door, just cover as much as you can, because some places you will not be able to reach with your hands. Use the roller that comes with the Mat with back and forth motion to make sure it sticks well. The work is not hard, but it is time consuming, and you will be rewarded at the end if you are an audiophile, as your music will sound much better, specially the bass; it will also totally eliminate the rattling coming from the door. Here are the trunk pictures I promised to post but forgot. 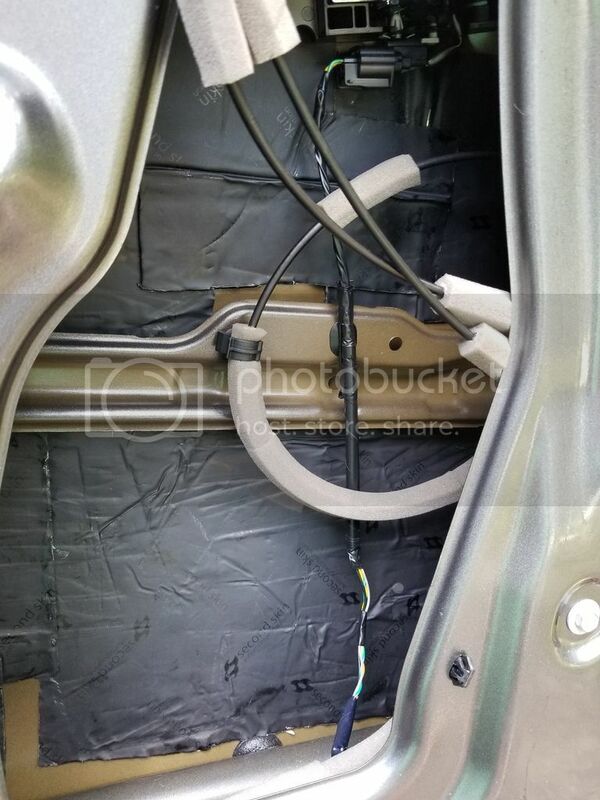 The trunk door also rattles, especially if your sub woofer is located there. But the FatMat will stop the rattling, you can see it shakes to the sound of the bass, but it does not rattle. - There are too many wires on the outside of the trunk door, so I only did the inside. 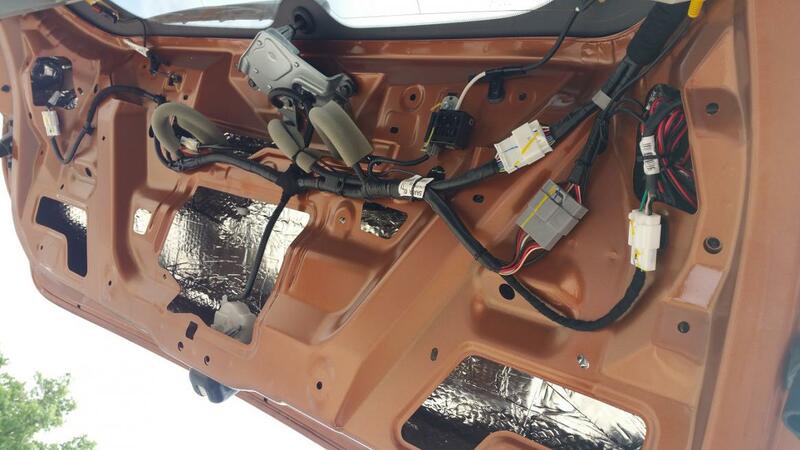 While researching the Murano before purchase (2017.5) I noticed a picture of the Murano (current gen) on the assembly line prior to the dash and interior mechanicals installation. 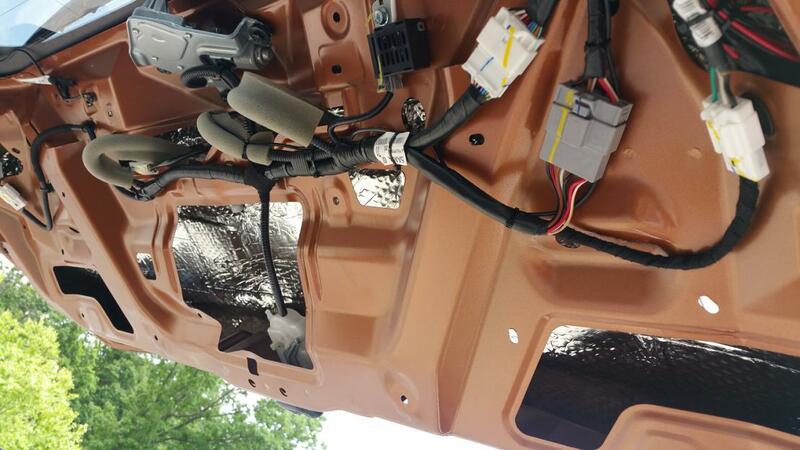 The vehicle has a huge, thick, sound deadening mat (looks to be a cloth composite) that spans the front interior from the windscreen to behind the peddles, and from door to door. It was huge and impressive looking. Just a tidbit for those that might be wondering what's underneath the dash up-front. Finally got around to starting work on my audio system. Sound deadened the doors and the difference in the road noise was amazing. Put a layer of Secondskin damplifier pro on and it worked wonders. 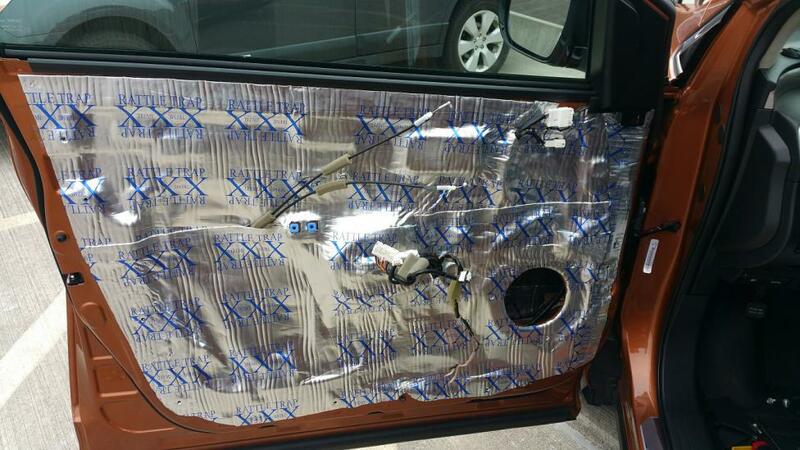 Taking the skin off and seeing what was inside the door (or lack there of ) was a real disappointment with Nissan. One crash bar low in the door rest of the door is pretty thin cheap steel. The doors have a real solid feel to them. The ringy tinny sound is completely gone. i95 traffic noise has been greatly decreased. What I found is you don't have to go crazy with how much you put in or being super neat about it. Took about 4 hours for the first door just getting situation. 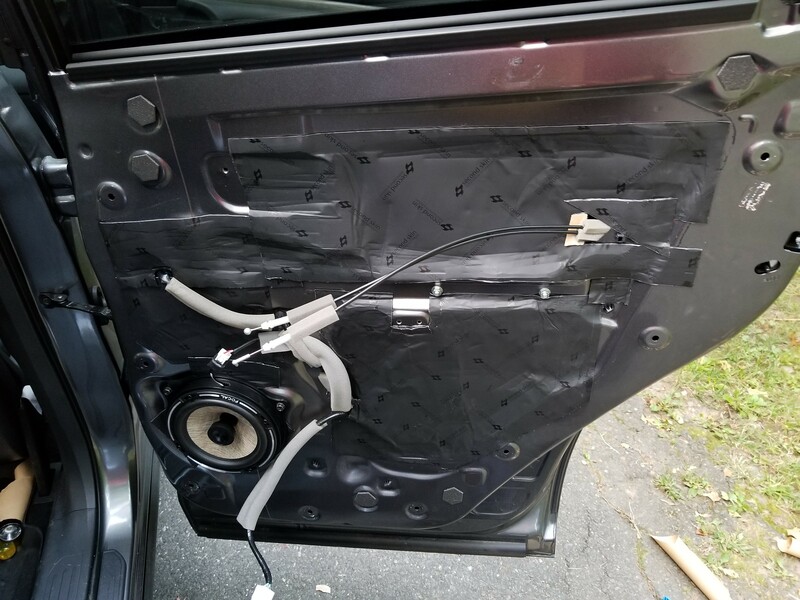 Also installed Focal speakers in the doors so had to do some modifications to the adapter I got from crutchfied - just drilled a hole through the side of the adapter to feed the speaker connection adapter though. Other three doors took about 2 hours a piece for me. If you are on the fence about doing install , don't worry - it's quite easy. Three screws that hold the interior skin in (10mm screws used throughout). Pop the panel off and your in business. Back doors are cake to do too. I used about 5 sheets each for the front and 4 each in the back. Cut the material into smaller pieces, you don't have to install in a contiguous piece. Nor do you have to get every square inch, just where you can reach. The secondskin material is very easy to cut, i used tin snips personally though. There is no odor whatsoever to this material also. I used larger sections on the inner (facing interior compartment) to cover the holes. Also reinstalled the factory vapor barrier on top of the material. I would also recommend getting one of the wood rollers to help installing. You definitely don't need a heat gun with this material. Also did not wear gloves and with 10 hours of dealing with the material not one cut from it. Next step is getting an amp installed. Thinking about an Audison 8.9 bit. It's not necessary to have 100% coverage in the interior and it would take forever to do. While not as clean looking as some it's a hell of a lot easier to put smaller pieces in than one big piece. it starts to want to stick to everything inside the door as you try to get it into position. Noticed a few things since soundproofing the doors. The noise from other vehicles has been significantly reduced, however with a reduced noise footprint in the MO the engine and drivetrain noise is more noticeable. I'm thinking I may look into what is involved with pulling the carpeting back and installing more material in the interior firewall and front flooring (if anyone knows what is involved or a youtube vid let me know). The doors have a very solid , heavy feel - all the tinny sounds they made are gone including the tinny sound the handle made opening and when it released back. Can't say it made (or didn't make a difference in sound quality of the speakers as I swapped the stock speakers for the Focals while I had the skins off. 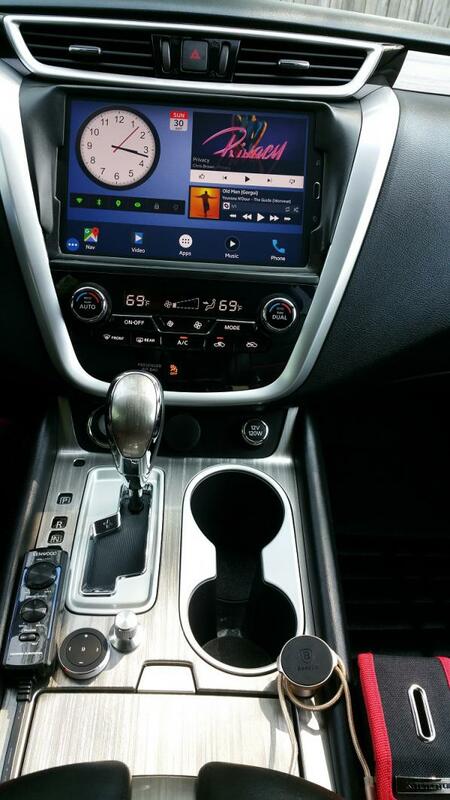 How did you get the clock to display in analog?Is this a stock radio?